Sauni-Rae is the Guest Designer for the Potpourri Basket challange. 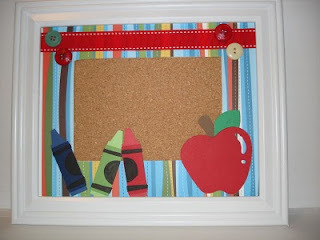 This cute Cork Board Frame is a great back to school project. She says "I did not paint a frame as I could not find a not painted one so I purchased something close. The only hint I would put in that is different or in addition to the directions is go slowly if you have to cut the cork board as it crumbles. This really was a fun and quick project. I know just who is going to get this as a gift! Please be sure to stop by her blog and say hello! What a fantastic idea. Thanks for sharing. That would be a great gift for a teacher. Very pretty.